Chickpeas are one of the earliest cultivated legumes, with evidence that they’ve been grown for about 7,500 years. Were our neolithic ancestors swapping hummus tips? Quite possibly; the Roman gourmet Apicius gives several recipes. Interestingly, the word hummus is the name of the chickpea itself in Arabic. What we call hummus is hummus bi tahina (chickpeas with tahini). Chickpeas are also used in Spanish, North African and Indian cuisine. There are two main types: the desi, which are darker and smaller and the kabuli, which are larger, smoother and lighter. The latter is grown in southern Europe and north Africa, and it’s the one we come across more frequently, but they are also grown in the USA and Canada. Worldwide chickpea production totals no less than nine million tons a year. The cooked yield is around two and a half times the dried weight and volume, although this will vary slightly according to your chickpeas. Chickpeas generally taste better if you remove some of the tough skins. To do this, submerge the chickpeas in water. Rub them between your hands and give them a good swirl, then skim off any loose skins which float to the top. Repeat several times, drain and rinse again. 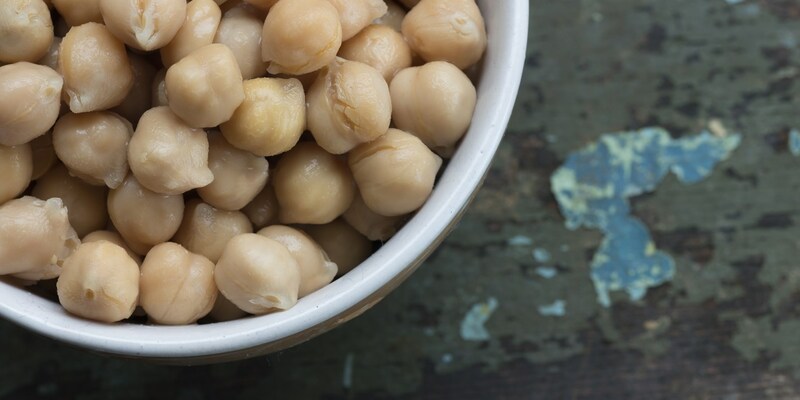 To freeze, arrange a single layer of chickpeas on a piece of clingfilm or on a silicone baking mat on a tray. When frozen, pack into bags or plastic boxes. Probably the most well known use of chickpeas is to make hummus. Bryan Webb serves up a Quick and simple hummus, or for something a little different try Victoria Glass’ unusual Beetroot hummus with squid ink flatbread. They are also great as part of a curry – try Paul Heathcote’s Quick vegetable curry for a filling vegetarian main. Chickpeas are also the main component of falafel; Phil Fanning serves his Hogget mezze with falafel and walnuts. They are fantastic in salads, too – try this Roasted carrot and chickpea salad or Alfred Prasad’s Chickpea, mango and edamame ‘sundal’.